Msgr. Kozar speaks at Immaculate Conception Seminary in Huntington, New York. When CNEWA’s president Msgr. John Kozar looked at those gathered around the room Wednesday, he described it as a gathering of “family.” But if it was a family affair — and with about 60 people scattered around on sofas and easy chairs, it felt familiar — it was also one with a purpose. The event, held in the faculty lounge at the Immaculate Conception Seminary in Huntington, New York, brought together supporters, donors and interested Catholics from around the greater New York area to learn the latest on the situation in Iraq and Egypt from Msgr. Kozar. He traveled to the region for a pastoral visit earlier this month, along with Cardinal Leonardo Sandri, Prefect for the Congregation for Eastern Churches. And, significantly, he spoke poignantly of the Iraqi people’s indomitable spirit. CNEWA president Msgr. Kozar speaks about his recent pastoral visit to the Middle East. It was the same story, he explained, in Egypt. Msgr. Kozar also told of visiting Cairo and meeting the “garbage pickers” — who have some of the most thankless jobs in the country. There are hundreds of thousands of them, yet their neighborhood isn’t even marked on any official map. But, he said, they have tremendous faith. It is that faith, he said, that continues to uplift all the peoples of that troubled region — and faith which CNEWA is working to sustain and support through its many programs. That support comes from the prayerful generosity of many people, known and unknown, as one of the hosts of the event, Msgr. Peter Vaccari, said. In an interview after the talk, Msgr. Vaccari, the rector at St. Joseph’s Seminary in Yonkers, New York, described an effort the seminary undertook this year during Lent. That effort collected nearly $5,500 for the agency. The event at the Huntington seminary, meantime, raised over $40,000 for CNEWA’s programs in the Middle East. It is Msgr. Vaccari’s hope that these efforts will also help plant seeds in the hearts of the seminarians, who will remember the work of CNEWA after they are ordained and further help spread the word. Those who attended heard Msgr. Kozar describe his recent pastoral visit to Iraq. Our brothers and sisters in Iraq continue to pray for all those who are praying for them — and their hearts are full of gratitude. “They will never take away our faith,” the little girl said. To help her and so many others, please visit our giving page. Msgr. Kozar was welcomed to Immaculate Conception Seminary by Msgr. Richard Henning, left, rector, and Msgr. Peter Vaccari, right, rector of St. Joseph Seminary in Yonkers, New York. Two young students take a break during class at the Armenian School inside the convent in the Old City of Jerusalem. 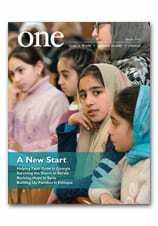 To learn more about the lives of Armenians in this small, close-knit community, read “Living Here is Complicated” from the Winter 2014 edition of ONE.